The colonial tractor was a class of engine built by several engine manufacturers to satisfy a demand in the Colonies for road haulage tractors of a heavier than normal construction and with the ability to burn a wider range of fuels than the engines made for the home market. This road tractor was new to Hereford County Council and was one of three similar engines supplied to them; all three of which are preserved and regularly seen at rallies today. Clementine was used on council business until 1939, hauling road building materials, etc. From 1939 until the mid 1950s she was used commercially, primarily for threshing, in Herefordshire but was then laid-up until sold for preservation under the name "Hereford Belle". Following an early attempt at a showman's conversion she was restored to her original condltion and is now presented as an authentic example of a very popular engine, particularly liked by those who had the fortune to drive them. 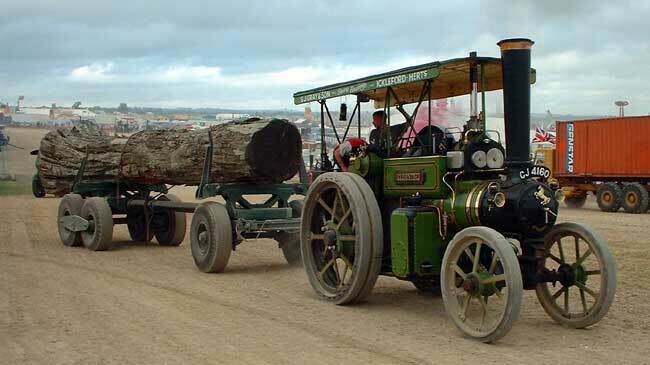 By traction engine standards these steam tractors are fast on the road, travelling at about 12 m.p.h. on the level, and were advertised, rather optimistically, as capable of pulling a load of about 10 tons.